We’re excited to tell you about a new program, our Speakers’ Bureau where we’re working to collaboratively educate, empower, and activate community leaders across the country in underserved communities and to support their efforts to develop and implement grassroots advocacy to effect change in the breast cancer epidemic. create space for speakers to ask questions and help frame the breast cancer agenda around topics that matter for their community. Earlier this month, we held the first orientation for twenty-one speakers from around the country, from California to Texas to Florida and New York. These activists have joined BCAction to help change the conversation about breast cancer and identify emerging breast cancer issues in their communities. There are many factors that bring people to the Speakers’ Bureau. For some it is about sharing fact-based, unbiased information about breast cancer with their community and articulating BCAction’s mission, which parallels their own mission. For others, it’s about encouraging people to think more about preventing breast cancer in the first place, and moving beyond awareness and pink ribbon culture to confront the ugly realities of breast cancer and bring about change. And others want to connect to other people in their area who are also working on breast cancer advocacy, knowing that direct personal communication by committed voices is the best avenue to bring knowledge and change. If you are interested in joining our Speakers’ Bureau or know someone who would make a great applicant, please contact Sahru Keiser at skeiser@bcaction.org. Although our Speakers’ Bureau project is still in the early stages, we’ve been encouraged by the interest and excitement from public health advocates at both the Intercultural Cancer Council’s conference in July 2012 and the California Wellness Foundation’s Women’s Health conference in October 2012. 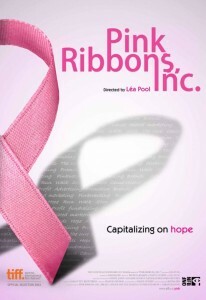 As Pink Ribbons, Inc. ends its theatrical run, we are excited to see activists and educators from around the country picking up copies of the DVD and using the film to host community organizing and educational events. BCAction staff and members across the country have been facilitating discussions, answering questions, and distributing Think Before You Pink® Toolkits and other educational materials to complement the film. BCAction members have attended screenings and facilitated discussions about the film across the country, including in Illinois, New York, Florida, and New Jersey. Two recent screenings, organized by the Women’s Cancer Resource Center and The Shanti Project, brought together health professionals and activists working on breast cancer issues in the San Francisco Bay Area. Zoe Christopher, our Information and Resource Liaison, and Sahru Keiser, our Education and Mobilization Coordinator joined in active discussion about the themes and issues raised in the film and provided toolkits to attendees. If you are interested in organizing a Pink Ribbons, Inc. screening for your organization or community, please contact Sahru Keiser at skeiser@bcaction.org for more details. If you are interested in making a donation of $50 or more we’ll happily send you your own copy of the Pink Ribbons Inc., as a thank you gift. Last month, the same three-judge panel in the Federal Court of Appeals reached the same misguided conclusion on Myriad’s BRCA 1 & 2 gene patents: “Yes, it’s legal to patent human genes.” The good news is our lawyers at the ACLU are requesting the Supreme Court hear our appeal – again. We’ve been working on this legal challenge since 2009 and we won’t stop until corporate patents on the “breast cancer genes” are a thing of the past. We will keep you posted on whether the Supreme Court accepts our case and what the next steps are in this legal challenge. Thanks to your efforts and those of our coalition partners at the Campaign for Safe Cosmetics, the manufacturing giant Johnson & Johnson agreed in August to phase out chemicals linked to cancer from its baby products and adult cosmetics. Victories like this are important because they demonstrate that companies can and will make safer products when activist pressure is strong enough. However, if we want to stop cancer before it starts, creating a safer environment one chemical or one company at a time will take much too long. We cannot rely on corporations to voluntarily do the right thing; we need federal regulation that prevents companies from using chemicals that harm our health in the first place. We made important progress with Johnson and Johnson, and we won’t stop until we get the big-scale reform we need: robust Safe Chemicals and Safe Cosmetics Acts. As the bill moves through the many stages of becoming law in the coming months, we will continue to work with Safer Chemicals, Healthy Families Coalition to push for strong congressional approval of this important legislative reform. Thank you for taking action and for continuing to support Breast Cancer Action’s work to stop breast cancer before it starts. Since our webinar program began over one year ago, we have presented twelve unique webinars, reaching over 2,800 people in 45 states and 18 countries. Our webinar program seeks to educate BCAction members on relevant breast cancer advocacy issues and propose next steps and ways to take action. Our webinars are free and open to the public. Visit our website to learn about upcoming webinars and view all of our past webinars. Breast Cancer Action’s advocacy and education work is always focused through a social justice lens. We believe that, to end the breast cancer epidemic, we must continue to address the social inequities related to breast cancer. Our new report, titled “Health is Not Just Healthcare,” begins to gather what we know (and don’t know) about both how the social determinants of health (where we live work and play) are so crucial to our understanding of the inequities in breast cancer. In addition, we look at how women continue to face barriers to high quality healthcare after they have healthcare access. Inequities in breast cancer are a complex interplay of numerous social factors and the solutions must address this complexity. We must move away from a focus on changing individual behavior and move to solutions that focus on the broader social and economic contexts in which we all live. We’ll be releasing the report early 2013. For more information on health inequities, please contact Sahru Keiser at skeiser@bcaction.org. We also have two webinars: “Inequities in Breast Cancer: Race and Place Matter” and “Reducing Inequities in Breast Cancer: Why Experience Matters.” You can view these webinars on our website here. Our executive director, Karuna Jaggar, has joined the California Breast Cancer Research Council for a three-year term. The CBCRP works to end the breast cancer epidemic by leading innovation in research, communication, and collaboration in the California scientific and lay communities. Serving on the council is an important way Breast Cancer Action is helping shape the breast cancer research agenda, especially research that otherwise might go unfunded because it is not profitable for Big Pharma.